L.A.’s craft beer scene has grown exponentially in the past few years, leaving beer fiends to wonder not if there’s a brewery they want to check out, but when and how many. That’s where LA Beer Hop comes in. 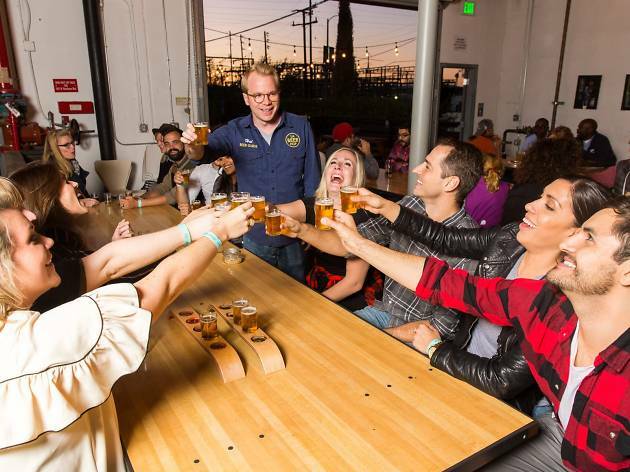 Started by husband and wife Hal and Cindy Mooney, Beer Hop offers brewery tours on the weekends, offering tours that focus on different L.A. neighborhoods. Tours last for 4 to 5 hours and are led by a knowledge Beer Hop guide, driving each group to three breweries while providing fantastic information along the way. No two tours are alike: on a South Bay excursion, you may be taken to Monkish, Three Weavers and Phantom Carriage one weekend, and King Harbor, The Dudes and Absolution Brewing on another. 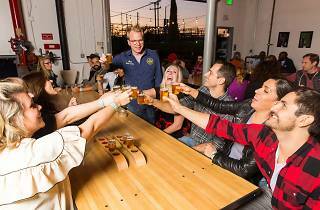 East/Central L.A. tours traverse the city from Mumford to MacLeod to Eagle Rock Brewery. And at $69, the tours are a steal—not only do you have a built-in designated driver, but each brewery includes a sizeable flight, letting you try a wide variety and leaving you thoroughly tipsy (at the bare minimum). The Beer Hop bus arranges for pick-up at metro stops to ensure as little driving on your part as possible. And your fellow tour members? Well, that can all depend, but after a flight or two we’re sure you’ll all be singing together on the bus in no time. I had a blast during my South Bay Beer Hop tour. Our guide was personable, funny, kind and knowledgeable, and he took us to some great breweries that I'd never been to before. We had plenty of beer and food, and our group - most of us strangers - all got along really well.